The exquisite interior of this magnificent vessel has been tastefully crafted with intricate Moroccan inspired design. Boasting a wide range of facilities, large stylish sun decks and first rate service, the MS Darakum offers exceptional value for such a luxurious cruise on the Nile. This is an ideal way to see many of Egypt’s sights with an accompanying Egyptologist, whilst returning to the comfort of your cabin each evening. Your cruise is accompanied from Day 1 to Day 7 by a local English speaking tour guide/Egyptologist. Extensions are not escorted but assistance is provided in each destination by our local representative. 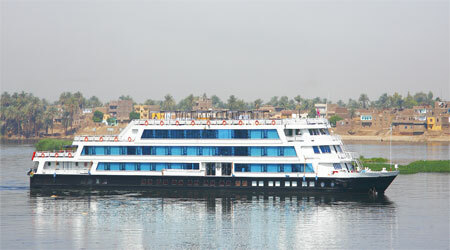 • Prices include breakfast, lunch and dinner on board the MS Darakum, breakfast in Cairo, Luxor and Sharm. • For guides and boat crew we recommend tipping at the end of your cruise. • We would recommend taking a sun hat and glasses and a few jumpers especially during the winter months of December, January and February. A camera is a must. • Itineraries are subject to change with little or no notice. Entrance fees to antiquities can increase with little notice. The itinerary on this cruise may be demanding for some clients. Depart from Heathrow on EgyptAir and upon arrival embark your ship MS Darakum, one of the largest and most impressive vessels cruising the Nile. Docked in one of Luxor's smartest private docking areas, discover the ship's glorious facilities, including a stylish lounge and sun deck. 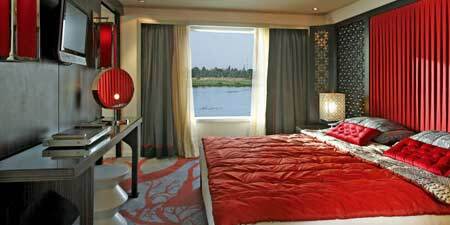 Settle into your well-appointed Nile-facing cabin and spend tonight in Luxor. This morning visit the West Bank and see the Colossi of Memnon who once guarded the Mortuary Temple but now stand alone. Visit the Valley of the Kings and Queens, entering temples still covered in original paintings and colours. Make a stop at the Temple of Hatshepsut, the only female pharaoh and visit an ancient temple built in a strangely modern style. Experience an exciting moment this afternoon as the Darakum sets sail for Edfu, as you watch life on the banks of the Nile pass by. Overnight in Edfu. This morning visit the stunning temple of Horus in Edfu, the most well-preserved temple in Egypt. In fact, original coloured paint still remains from 2000 years ago. Sail to Kom Ombo, a unique double temple dedicated to Sobek and Haroeris, set on a beautiful site on the banks of the Nile. Continue sailing to Aswan. After breakfast marvel at the High Dam, an amazing feat of engineering built to provide electricity for rural areas of Egypt. Visit an ancient quarry where you will see an obelisk broken during carving. Finally, visit the Philae Temple, dedicated to the goddess Isis, situated on a small island on the Nile. After lunch enjoy some time to explore the beautiful and ancient sights of Aswan situated on the First Cataract of the Nile, or take a leisurely and scenic sail in a felucca. Overnight in Aswan. Today is free for you to explore Aswan or alternatively partake in a recommended optional excursion (at extra cost) by air to Abu Simbel. An exciting 30 minute flight will transport you to this spectacular archaeological site on the banks of Lake Nasser, where ancient attractions include the Great Temple built by Ramses II. Dating back to the 13th Century BC but entirely relocated to save it from flood waters in the 1960s, Abu Simbel is now part of a designated UNESCO World Heritage Site. Visitors can explore the temples and have a chance to stand at the feet of the colossal statues of Ramses II, which are over 20 feet high. Overnight in Aswan. Set sail for Luxor. Enjoy time on board simply watching the sights of the Nile pass by, soak up the sun from the Darakum's sun deck or perhaps even take a light workout in the minigym. Overnight in Luxor. During your early morning visit to the East Bank, see the magnificent temples of Karnak and Luxor, built in honour of the Egyptian sun god Amun Ra. Walk through the majestic hypostyle hall with its magnificently painted pillars and gaze at the collective work of 13 centuries of successive pharaohs. Drive to Qena and visit Dendera Temple which has scenes on the external wall portraying the famous Queen Cleopatra and her son Caesareon. Drive back to the boat to relax. Disembark after breakfast and transfer to the airport for your EgyptAir flight to Heathrow.